When searching for a perfect vanity to complete your vision of the ultimate spa-inspired bathroom, you want style and function - the Simpli Home Chelsea Bath Vanity offers both. Constructed with a solid hardwood frame and legs, the Chelsea presents a luxurious, contemporary centrepiece for any bath upgrade. A soft white cabinet paired with a white countertop and sink brings a light, airy feel to your space, easily complementing any colour scheme or decor style. With spacious interior cabinet storage and four drawers, you'll enjoy plenty of room for bath essentials and more. Add a level of sophistication to your bathroom with the Ariana 48 inch vanity. 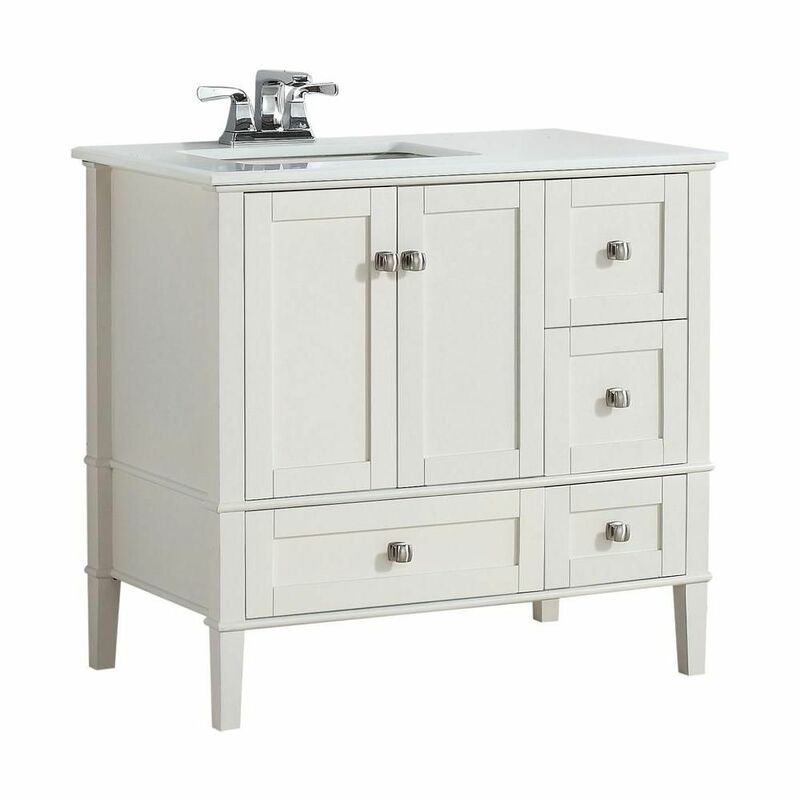 This vanity offers a classic style with its moulding detail and curved door and drawer pulls. The three drawers and four doors conceal ample storage space for optimal functionality. The Bombay White Quartz Marble counter top with the under mount rectangular sink complements the white cabinet. Its classic look adds a luxurious feeling to your new transitional style bathroom. With its black finish and brushed nickel rounded square knobs, the Simpli Home 24-inch Chelsea Vanity fits beautifully with a contemporary look. The vanity offers ample storage with 2 doors and 1 bottom drawer. It has a white quartz marble top with an under mounted rectangular sink. The unit comes pre-assembled. With its soft white lacquer finish and brushed nickel rounded square knobs, the Simpli Home 36-inch Chelsea Vanity fits beautifully with a contemporary look. The vanity offers ample storage with 2 doors and 1 bottom drawer. It has a white quartz marble top with an under mounted rectangular sink. The unit comes pre-assembled. The Simpli Home 48-inch Chelsea Vanity is defined by its black finish, brushed nickel rounded square knobs and casual contemporary look. This beautiful assembled vanity provides a large storage area with 4 doors and 2 bottom drawers. The unit also includes a white quartz marble top with an under mounted rectangular sink. Chelsea 36-inch W Vanity in Soft White with Quartz Marble Vanity Top in White and Left Off Set Sink When searching for a perfect vanity to complete your vision of the ultimate spa-inspired bathroom, you want style and function - the Simpli Home Chelsea Bath Vanity offers both. Constructed with a solid hardwood frame and legs, the Chelsea presents a luxurious, contemporary centrepiece for any bath upgrade. A soft white cabinet paired with a white countertop and sink brings a light, airy feel to your space, easily complementing any colour scheme or decor style. With spacious interior cabinet storage and four drawers, you'll enjoy plenty of room for bath essentials and more. Chelsea 36-inch W Vanity in Soft White with Quartz Marble Vanity Top in White and Left Off Set Sink is rated 4.8 out of 5 by 27. Rated 5 out of 5 by HomeDepotCustomer from Exactly what I wanted.... Exactly what I wanted. Rated 5 out of 5 by Joe from A very nice piece, well made of wood not pressboard. Love the deep sink and plenty of space in t... A very nice piece, well made of wood not pressboard. Love the deep sink and plenty of space in the drawers. Would recommend this product to anyone looking for more than a basic vanity. Rated 4 out of 5 by Jeepgirl from I put a Simpli Chelsea vanity in each of my... I put a Simpli Chelsea vanity in each of my three bathrooms. They are beautiful and solid! Two came with a solid white marble top. The last one has gray veining in the white. But it works for me. Two vanities have a door that sticks and has to be pulled down to open, thus the 4 stars. Rated 5 out of 5 by shar from this vanity is simpli beautiful, soft close drawers would put it over the top, well made and pack... this vanity is simpli beautiful, soft close drawers would put it over the top, well made and packed well for the trip... my first order got lost at the store, the second one was a little late, by a couple days..but no regrets.. Rated 5 out of 5 by HaffieLover from We haven't installed this yet, but have unpacked it. It is a very nice looking vanity, and high ... We haven't installed this yet, but have unpacked it. It is a very nice looking vanity, and high quality. Very happy with our purchase.